This week I stumbled across this articlefrom nymag.comabout introverts. The article expresses that there are four different kinds of introverts: social, thinking, anxious, and restrained. I love this article because I consider my self an introvert but always pushed it aside because I stereotyped “introvert” as the awkward-girl-who-loves-anime, or something ( no offense if you like anime). 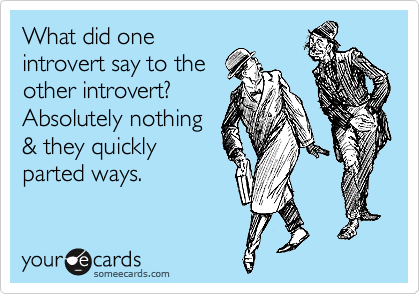 Then while studying counseling in grad school I came across the term “extroverted introvert” meaning that in social situations I can be extroverted and friendly but as soon as thats over I need alone time. According to this article I am a social introvert. Don’t know what type of introvert you are? Or if you are even an introvert at all? No worries. Theres a little quiz in the article you can take!